Keeping your back healthy is like tuning a piano. The knee-to-chest posture helps you adjust and relax your lower back. If you have knee problems, hold the back of your thigh instead of just below your knee. Remember, this pose isn't a biceps exercise. Just hold your knee, breathe, and relax. 1. Lie on your back with your knees bent palms down and feet flat on the floor. 2. 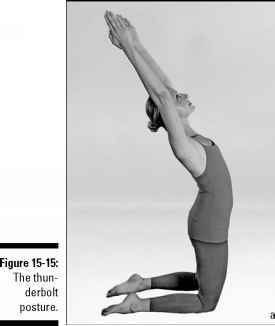 As you exhale, bring your right knee toward your chest, holding your shin just below your knee as in Figure 22-2. 3. Stay in the posture for six to eight breaths. 4. Repeat Steps 1 through 3 with your left leg.